Posted On Sun, 08 Feb 2009 04:08:00 +0000. Filed in family, festivals, writings. By Vaibhav Bhandari. Hope things are going great with you. Things have been pretty busy and hectic since start of this year, haven’t even gotten a chance to send my usual welcoming new year email. I thought I will combine that email with another element – WalkMe. WalkMe was started sometime in December as a skunk works projects with some colleagues of mine. Our management liked it and last week we released it as a “Sandbox for Microsoft HealthVault” project. I’m really glad that this effort is seeing light of the day, I would love if you give a go and provide us feedback. Perhaps, put the widgets on our blog, twitter or facebook. So – take out your pedometers (or use Manual entry), take WalkMe for a stroll… and walk with us! 2008 – started with an India trip. Myself, my sister and Maris had a great time visiting India. Unlike previous trips this time we kept some time to travel in India, and went around to Delhi, Jaipur and Agra – the quintessential golden Triangle. We had all kinds of experience – loved Jaipur, hated Agra and Delhi was alrite J. 2008 – end with travel as well ! Infact the same group J, myself, Vaidehi and Maris were in Mexico from Christmas to Jan 7th. It was an amazing trip –we went from Mexico City, to Morelia to Zihuatenejo – loved the culture, crafts and the climate J. In August, my parents visited us for a couple of Months– we had great time showing them around in Washington, British Canada, California and the East coast. I didn’t get to climb a lot last summer. However I was able to get up Mt. Baker, try some ice climbing and go for a back packing trip along Olympic coast. I also managed to finish the ride from Seattle to Portland with absolute zero training J. This year – I’m planning to improve on this front and try and be outdoors a little more. So do remind me that every now and then when you see me working too hard or spending too much time on computer. On the work front it was really hectic and successful year. I was able to do some open source at Microsoft – help in a Ruby, PHP and Java library for your platform. I represented these libraries and effort in OSCON 2008. After write quite a few post about how to write libraries and code for HealthVault, my blog is featured on our MSDN homepage. 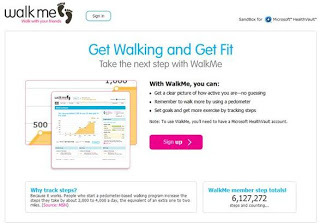 WalkMe is my small drop in the next step of bringing helping bring some eyes ball and viral effect for HealthVault. On the education and entrepreneurship areas – I finished my 9 month Certificate in Business Development course from UW (I started winesofeast of out of that course in April). I’m also delving in idea of creating a venture fund for startups focused on bringing change in India, currently we are looking for board of advisors if you have a recommendation please drop me a line. Wont bore with much more, I’m going to put list all of my writings and activities for 2008 on my blog here. Please do drop me a line and let me know how things are goings. Sorry I couldn’t be personal as much as I would have loved. So wishing you great little less than 11 months of 2009 ahead and keep in touch!